For anyone who still has doubts about the culpability of the military during last month’s deadly attacks on demonstrators in Downtown Cairo, here is some disturbing new footage. The video clearly shows armoured vehicles repeatedly driving back and forth through crowds of protesters and speeding directly into several people. It gives a frightening sense of the claustrophobic chaos which led to the deaths of 27 Egyptians. Anguished Christian mourners turned out in their thousands in Cairo today to remember their dead and voice their anger at the Egyptian army over clashes that killed 26 members of their sect. On another day of violence in the Egyptian capital, there was further trouble when angry Coptic Christians threw stones at riot police outside the hospital where dozens of casualties had been brought. And as the leader of Egypt’s Christian minority, Pope Shenouda III, presided over a service for mourners at a cathedral in eastern Cairo, attendees at the mass funeral vowed to defend their faith at any cost. At the Coptic Orthodox Cathedral in Abbassia, thousands of mourners chanted “With our soul and our blood we will defend the cross” while waiting for the service to begin. Pope Shenouda III went on to declare a three day period of mourning, prayer and fasting for the victims, who were protesting against attacks on churches in Upper Egypt. “Strangers got in the middle of our sons and committed mistakes to be blamed on our sons,” the Coptic Church said in a statement. The atmosphere before the service was uneasy, with one woman outside berating a journalist wearing a headscarf. “You’re wearing a hijab, but you’re not modest,” she shouted. 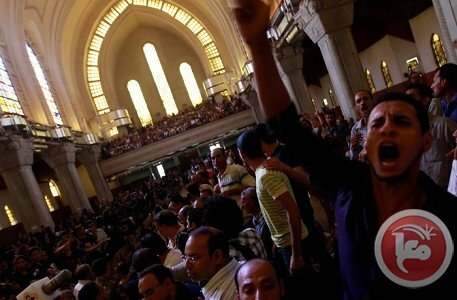 Earlier in the afternoon at the Cairo Coptic Hospital, where dozens of casualties had been brought on Sunday night, there had been further clashes when hundreds of Christians attacked riot police – albeit on a much smaller scale than yesterday. Demonstrators outside the downtown building waved crosses and shouted slogans for the dead protesters, such as “Oh martyrs sleep tight, we’ll continue the fight”. Egypt’s interim Prime Minister Essam Sharaf condemned the violence, saying it had “taken us back several steps”. He also blamed so-called “foreign meddling” for the trouble and claimed the problems were part of a “dirty conspiracy”. Yet some protesters blamed the government for instigating the trouble through its broadcasts on state television. At one point during the violence on Sunday night, broadcasts were asking Egyptians to defend the army against attacks. “Egyptian TV was saying that if you are Egyptian and you like your country you should go down and protect the army from us,” said Shady Ahmed, a 25-year-old who was present during the trouble. The violence has heightened fears among some activists that the ruling military council, which took power after Hosni Mubarak was toppled in February, will try to exploit the crisis for its own ends. There are already concerns that the revolution has hit the buffers. The ruling generals have said that presidential elections might be delayed until 2013, while the widespread use of military courts to try thousands of civilians has led to accusations of Mubarak-style authoritarianism on the part of the military council. Following the announcement last month that army chiefs will not be ditching the widely-loathed Emergency Law, some activists believe Sunday night’s confrontations have handed the military another excuse to maintain its stranglehold on power. Get posts from Spice Bazaar emailed straight to you! Sign up for the Spice Bazaar RSS feed!